He is expected to meet Chinese President Xi Jinping in Beijing, along with other officials, and sign 25 agreements, mainly in energy and transport. 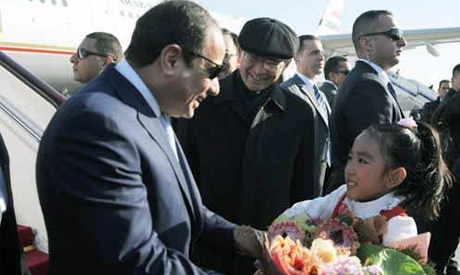 Among the projects El-Sisi is expected to address is the high-speed train to connect Alexandria, on Egypt's northern coast, to Aswan, near Sudan in the south. He shall sign an agreement on it with the Egyptian-Chinese Business Council. He is also discussing an electric railway network project. He is also holding meetings, a presidential statement said, with the Chinese private sector – the first with representatives of top 20 economic groups and the second with 100 companies. In addition, he will sit with 25 tourism companies and also with university heads. Egypt runs a trade deficit with China, importing $5 billion worth of goods in 2013/14 and exporting $488 million, data from the Central Bank of Egypt showed. China is Egypt's fifth largest trading partner after the UAE, Saudi Arabia, the US and Italy. El-Sisi had said previously that Egypt lacks sufficient investment to renovate its rundown infrastructure and develop its vital services. Egypt's ousted Islamist president Mohamed Morsi also visited China during his brief year in power. No one is perfect but we need to try to do our jobs right, as I believe in all the world is running by hard workers and honest people. If all the Leaders and Ministers focus on the country not for their benefits,bonus,how much money will be in their accounts each day and their families have the best of everything. The country will move forward and the most important thing is, no one is above the law. Together we can do better and no matter how good or bad you think life is, wake up each day and be thankful for life . Someone, somewhere else is fighting to survive. God save Egypt, God bless you all.